Castle Vardulon: Mystery Solved: Scream Edition! Despite having seen the film Scream literally dozens of times, it held one lasting mystery. What, exactly, was opening victim Steve's last name? At the end of the movie he's credited only as "Steve", and the two times it's mentioned in the films weren't of much use. So is he Steve Orrest, as Rose McGowan suggests? Or is it Steve Orf, as Courtney Cox seems to say? Doctor "Orth"! Finally! 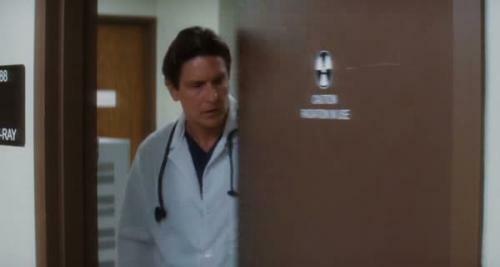 Yes, it seems that Scream 4 featured Steve's never-before-mentioned older brother, who's now a local doctor! It's a blink-and-you'll-miss-it performance, here's the half-a-second during which his face is visible. Also, in a scene that appeared in an earlier version of the script, but may never have been shot - it didn't show up in the deleted scenes - Doctor Orth even had a chance to ruminate on his family's role in the film franchise. Ah, Steve - you may have died a pointless death, but history will remember you fondly. Also, weirdly, now that I know what it's supposed to be, when I go back and watch those clips, I can totally hear those actresses attempting to say 'Orth'. Funny how the mind works, isn't it?